Authors: Suess, R. J.; Leong, E.; Garrett, J. L.; Zhou, T.; Salem, R.; Munday, J. N.; Murphy, T. E.; Mittendorff, M.
Abstract: Black phosphorus has attracted interest as a material for use in optoelectronic devices due to many favorable properties such as a high carrier mobility, field-effect, and a direct bandgap that can range from 0.3 eV in its bulk crystalline form to 1.7–2.0 eV for a single atomic layer. The low bandgap energy for multilayer black phosphorus consisting of more than approximately five atomic layers allows for direct transition photoabsorption that enables detection of light out to mid-infrared frequencies. In this work, we characterize the room temperature optical response of a black phosphorus photoconductive detector at wavelengths ranging from 1.56 to 3.75 µm. 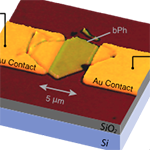 Pulsed autocorrelation measurements in the near-infrared regime reveal a strong, sub-linear photocurrent nonlinearity with a response time of 1 ns, indicating that gigahertz electrical bandwidth is feasible. Time resolved photoconduction measurements covering near- and mid-infrared frequencies show a fast 65 ps rise time, followed by a carrier relaxation with a time scale that matches the intrinsic limit determined by autocorrelation. The sublinear photoresponse is shown to be caused by a reduction in the carrier relaxation time as more energy is absorbed in the black phosphorus flake and is well described by a carrier recombination model that is nonlinear with excess carrier density. The device exhibits a measured noise-equivalent power of 530 pW Hz −1/2 , which is the value expected for Johnson noise limited performance. The fast and sensitive room temperature photoresponse demonstrates that black phosphorus is a promising new material for mid-infrared optoelectronics.